Franciscan Focus: Happy Fun Work Stuff. Only, not. :::gasp! ::: An actual blog post! To answer the question the 1.5 readers of this blog may be asking ... No, I haven't fallen off the face o' the Earth, I've just been Insanely Busy with work for the past few weeks and've therefore been unable to post here (it's not gonna get any better in the foreseeable future). In a nutshell: Due to upper management at my company being totally unrealistic and inflexible about us making a Completely Arbitrary ship date for our software, we've all been "asked" (read: "ordered") to work 60-hour weeks until July (or longer). And 'cause we drones are all salaried exempt employees, we don't get overtime. I do have some post ideas rattling around in my noggin' that I would like to share here (my motto: "Just Doing My Civic Duty To Waste Pixels, Bandwidth, And Your Time"), but by the end o' the workday, my brain is fried and I've no energy left over to form coherent thoughts, much less string 'em together in pixel-wasting format here. Because of all this Happy Fun Work Stuff, I've been trying to unwind by alternating between playing silly casual games online, and reading the Navarre Bible's "Matthew". (How's that for polar opposites?) So far, it's kinda' sorta' worked, though I've sorely neglected playing with The B (he ain't happy). And poor Husband Mike's had to deal with the quality of our conversations tanking and my increased mood swings. Well, at least we've got Easter to look forward to in a few days. 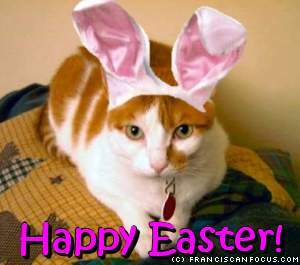 :-) Since chances are slim that I'll post again for awhile, I'll take the time now to wish ya a Happy and Blessed Easter! you mke me laugh, and too bad about work. I am in the midst of exam grades, and final grades, so the quality of my life has been reduced to all kinds of avoidance behaviors. they say a typical teachers work week is typically 60 hours, but really, that's not true at my level. nevertheless, commiserating wih you---can we call it helping each other share the cross?